A sub-par Nancy Drew knockoff. Miss Clue: Formula for Danger is a free online game, which is a very blatant knockoff of Nancy Drew: Ghost Dogs of Moon Lake. The developers clearly tried their hardest to be exactly like Nancy Drew. The game doesn’t have any credits, so we don’t know who made it, but given the large turnover at the Nancy Drew company in the past two years, it’s entirely possible that it’s a step-sequel game. Miss Clue is merely an “OK” game, in my book. There are some fundamental problems that prevent it from becoming great. The main problem is that it’s an episodic game. Not the good kind of episodic, where all the episodes were planned in advance, like Life Is Strange. It’s the bad kind of episodic, where the programmers weren’t able to finish the episode in time, so they said, “Uh…let’s just end it here and add another episode later.” Expect to see episodes end in awkward places, like the middle of a conversation or the start of a puzzle. Rumor has it that the game was originally intended to have 10 parts. The final game has 15. If you do the math, that means they missed their episode deadlines about half the time. There are two problems that arise as a result of the fact that the programmers made up the game as they went along. First, items will magically appear out of nowhere. The worst offender is the battery in the downstairs closet. The closet is completely empty for the first nine chapters of the game. In chapter ten? A tiny hitbox appears at the top of the closet, which gives you a battery. Good luck trying to find THAT on your own. The location was empty for the past two and a half-hours, and now it has new items, even though literally nothing has changed? Ha ha, it took me twenty minutes of going through every screen before I found the one item that was blocking my progress, aren’t videogames fun? The other problem is that every chapter begins, by forcing the player to backtrack and revisit all the areas of the game. That’s fine, if you haven’t played the game in a week, and you need to remember where everything is. But if you’re playing the game in one sitting, it is a humongous chore to do a thorough backtrack every 10 to 20 minutes. It would be so much better, if the main character could read all four library books at once, instead of having to make four separate trips to the library to read them at various points in the game. I should also mention a game-breaking glitch I encountered on the final chapter. The game expected me to have some inventory items which I didn’t have. Maybe I missed them, earlier. You’re not able to leave the area, without having solved the puzzle, so I was stuck. It turns out the solution is to quit and reload the game. The required items magically appear in your inventory. It’s not a problem if you play each chapter separately, but it’s kind of counter-intuitive to expect players to quit, right when they’ve reached the end of the game. Okay, so those are problems that come with the episodic format. They could be easily fixed, if the game was released as a single entity. I kind of wish they did release it as a full game by itself; that’d improve things a good deal. But there are also some problems that exist, outside of the format. #1. Voice acting. The voice actress made an honest effort, but all of her characters (besides Aunt Ellen) sound very similar. You can easily tell it’s a person talking to herself, when a conversation is between Jane and Jane with a lisp, or Jane and slightly higher-pitched Jane. #2. The premise. The premise is that you are Jane Darcy, the daughter of the protagonists of Pride and Prejudice. This interesting premise is introduced, then immediately discarded. There are no Pride and Prejudice characters or references anywhere else in the game. In fact, the game takes place at least 150 years after the book does. It’s weird to introduce such a specific premise, then completely ignore it. 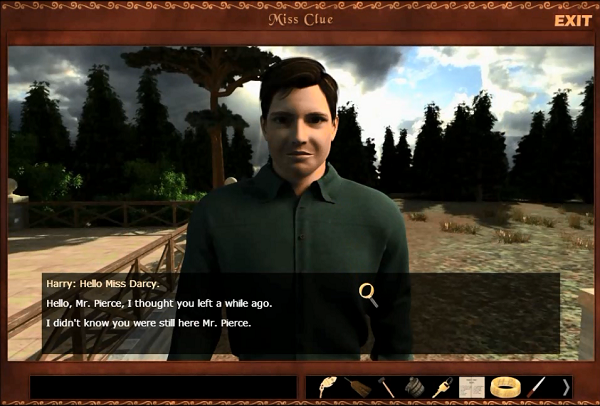 The end of the game kind of returns to the premise, by saying two characters got married at Pemberly Estate. The highlight of the wedding? Two girls singing a duet about their hot surfer boyfriends. Because that’s totally something Mr. Darcy from Pride and Prejudice would put up with. I should note that the hot surfer boyfriend song comes out of NOWHERE. Singing and surfing aren’t mentioned anywhere else in the game. Also, it’s out of place for a bride to singing about her bodacious boyfriend, at her wedding. He’s your husband now, Jane with a lisp. Stop calling him your BF. #3. Hitboxes. The hitboxes in this game are a tad too small, and they’re easy to miss. Twice, the only reason I found a hitbox was because it was mentioned in the walkthough. (Yes, I used a walkthrough; I’m a cheater!) This problem could be resolved by making the hitboxes bigger, or otherwise making it a little more obvious when your cursor is hovering over an area you can click on. #4. Speed. Since it’s an online game, it has a tendency to lag. More often than you’d like, you’ll be forced to sit still for a minute and wait for the loading screen to finish. The two main areas of the game are twenty screens apart, with most of those screens being scenery. If you’re caught in a bad lagging time, it’ll take you a full minute to get from Location A to Location B. That only makes the backtracking worse, since there is literally nothing to do on the screens besides click to go forward. 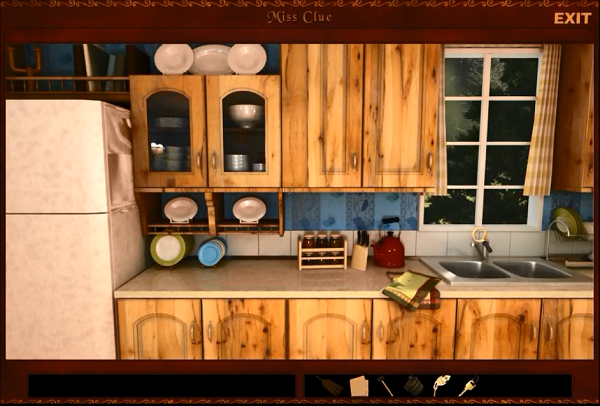 Is Miss Clue a good game? I would say “kind of”. 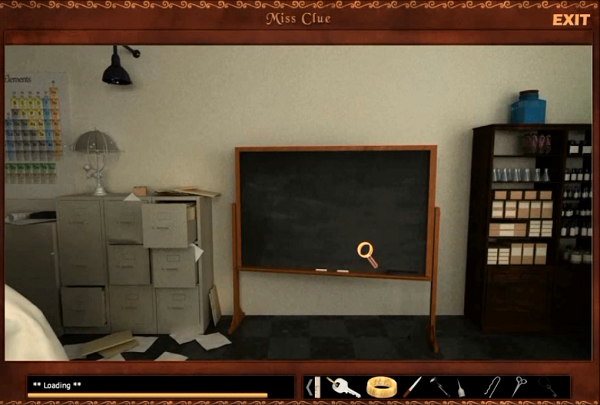 If you’re a fan of the older Nancy Drew games, you could probably get into Miss Clue. If they resolved the problems I talked about—most of which stemmed from the episodic format—then I could see it fitting in with the rest of the Nancy Drew series. It’d be a below-average entry in the series, but it would fit with the others. Which was probably the point, because the game is a Nancy Drew knockoff. For a game released this year, it certainly looks like something from the late 90s.